27 years have passed since Aghdaban tragedy against Azerbaijanis. 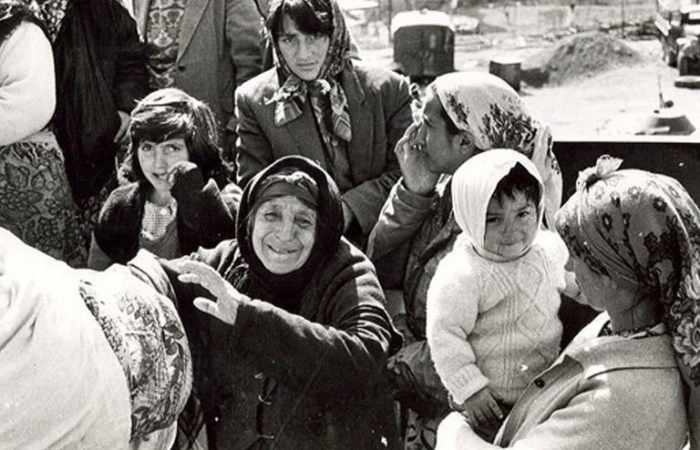 Aghdaban tragedy, which was perpetrated by Armenian armed forces a year before the occupation of Kalbajar, is one of the bloody pages of the aggression of Armenia against Azerbaijan. Aghdaban village is situated in Kalbajar district, on the right shore of Aghdaban river, on the slope of Aghdaban Mountain, south foot of Murovdagh range and 56 km far from the center of the district. In the night of 6th April, 1992, Armenian armed forces attacked to the Aghdaban village of Kalbajar district with the help of armed Armenians in Nagorno Karabakh, burnt the village, which was consisted of 130 houses, inflicted 779 peaceful people, killed 67 people brutally and perpetrated act of genocide. 8 90-100 years old aged people, 2 children, 7 women were burnt alive, 2 people were missing, and 12 people were caused damage in one night. Historical, cultural and architectural monuments were destroyed by Armenians, holy sanctuaries and cemeteries were annihilated and destructed. Manuscripts of virtuoso of Azerbaijani classical ashug poetry Ashug Gurban and his son Ashug Shamshir were burnt and plundered as a continuation of vandalism policy perpetrated by Armenian separatists against cultural heritage of Azerbaijan. Aghdaban massacre is suitable for its specification and character to the clauses of the the Convention on the “Prevention and Punishment of the Crime of Genocide” adopted on December 9, 1948 by the General Assembly of the UN, gives an opportunity to recommend it as genocide crime on the basis of international law and this massacre perpetrated by Armenian-Russian armed forces against peaceful people of Aghdaban village must be recognized by world community as a genocide crime. On April 2, 2014, in the commemoration day of the 21th anniversary of the occupation of Kalbajar, representatives of the society of Kalbajar district of Azerbaijan addressed to the Security Council of the UN related to the Kalbajar tragedy. In the appeal, it was mentioned that the crimes perpetrated by Armanian armed forces on April 8, 1992, in Aghdaban and Chaygovushan villages of Kalbajar, in April of 1993, in Bashlibel village are the next genocide acts against the Azerbaijani people. At present the Nagorno-Karabakh territory of Azerbaijan and the adjoining 7 administrative districts are under the occupation of the Armenian Republic. Zengilan: occupied on October 30, 1993, territory – 707 sq km.